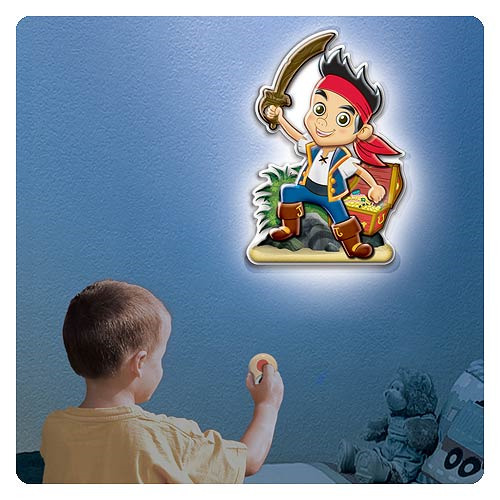 Now you can interact with the leader of the Never Land Pirates from the Disney TV show Jake and the Never Land Pirates from the comfort of your own room with the Jake and the Never Land Pirates Talking Room Light! Just touch the remote and watch as he lights up and talks to you with many fun, familiar phrases, including: "Ahoy matey! Do you want to join my pirate crew?" Not only does the wall display make for fun artwork in your room, but it can also be a night light, too. Measuring approximately 13 1/2-inches tall. Ages 3 and up. Requires 3x "AA" and 2x "AAA" batteries, not included.